This versatile kit is small in size but big on features! Designed for both airing up and down of tires, the 300P will fill a 33" x 12.50" tire from 15 to 30 PSI in about three minutes and air it down from 30 to 15 PSI in about two and a half minutes. 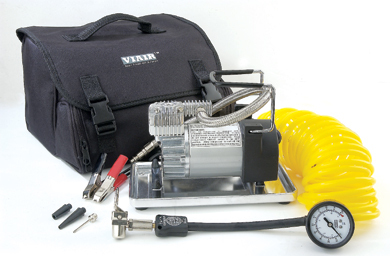 This kit comes with a 25 FT. inline deflator/inflator hose, an 8 FT. power cord with battery clamps, 30 amp inline fuse with water resistant fuse holder, a 1.5 FT. braided steel leader hose with a quick connect stud, an exclusive billet sand tray, and a convenient heavy duty water resistant dual compartment carrying bag.